Meet the luminescent Aequorea victoria. 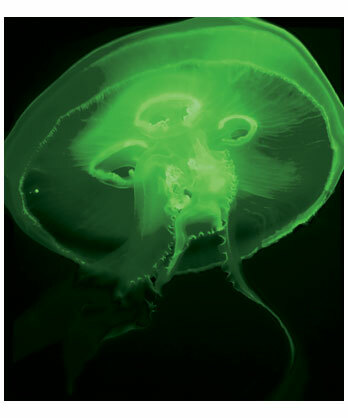 This jellyfish lights up the eastern Pacific Ocean with a green fluorescent signal. Producing this signal is a two steps process. 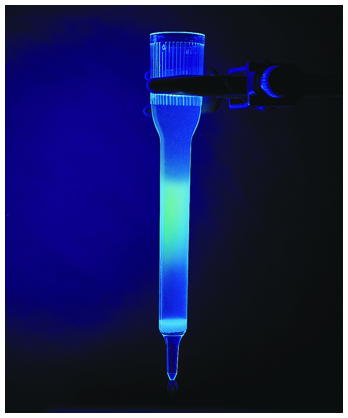 First a blue light is created through an interaction between released calcium (Ca2+) and the protein aeqorin. Then the blue light is turned green by a protein known as Green Fluorescent Protein (GFP). Both proteins have become powerful tools in biotechnology. GFP in particular has revolutionized the fields of cell and molecular biology. 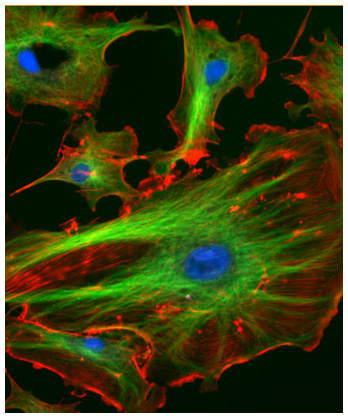 Because GFP exhibits bright green fluorescence when exposed to blue light, it is used as a visualization tool in fluorescent microscopy. GFP is made out of 238 amino acids whose order is encoded on a stretch of DNA. This stretch can be inserted into a gene (at the end of the gene but before the stop codon). The result is a bit like attaching a light bulb to the end of the protein, every time the gene is express GFP is also produced and the invisible protein is suddenly visible. This allows scientists to watch the movements, positions and interactions of the proteins. In such cases GFP is called a fluorescent “tag” and the protein is a “tagged” protein. There are a couple of properties that make GFP an especially good tag. One is that GFP does not harm the cells it is introduced into. This means that proteins can be visualized in living cells. Another is that GFP is very self-sufficient - it doesn’t require any accessories or cofactors or enzymes or substrates (other than molecular oxygen) in order to convert blue light to green fluorescent light. Finally GFP is small, so small that even when attached to another protein that protein is not affected.